Jewish ghettos in German-occupied Poland were established during World War II in hundreds of locations across occupied Poland. Most Jewish ghettos had been created by Nazi Germany between October 1939 and July 1942 in order to confine and segregate Poland's Jewish population of about 3.5 million for the purpose of persecution, terror, and exploitation. In smaller towns, ghettos often served as staging points for Jewish slave-labor and mass deportation actions, while in the urban centers they resembled walled-off prison-islands described by some historians as little more than instruments of "slow, passive murder," with dead bodies littering the streets. In most cases, the larger ghettos did not correspond to traditional Jewish neighborhoods, and non-Jewish Poles and members of other ethnic groups were ordered to take up residence elsewhere. Smaller Jewish communities with populations under 500 were terminated through expulsion soon after the invasion. The liquidation of the Jewish ghettos across occupied Poland was closely connected with the construction of highly secretive death camps built by various German companies in early 1942 for the sole purpose of annihilating a people. The Nazi extermination program depended on killing centers as much as on the effectiveness of their railways. Rail transport enabled the SS to run industrial-scale mass-extermination facilities and, at the same time, openly lie to their victims about the "resettlement" program. 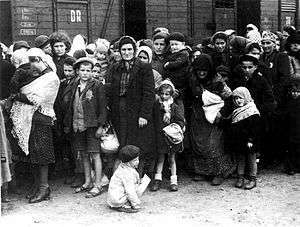 Jews were transported to their deaths in Holocaust trains from liquidated ghettos of all occupied cities, including Litzmannstadt, the last ghetto in Poland to be emptied in August 1944. In some larger ghettos there were armed resistance attempts, such as the Warsaw Ghetto Uprising, the Białystok Ghetto Uprising, the Będzin and the Łachwa Ghetto uprisings, but in every case they failed against the overwhelming German military force, and the resisting Jews were either executed locally or deported with the rest of prisoners to the extermination camps. By the time Nazi-occupied Eastern Europe was liberated by the Red Army, not a single Jewish ghetto in Poland was left standing. Only about 50,000–120,000 Polish Jews survived the war on native soil with the assistance of their Polish neighbors, a fraction of their prewar population of 3,500,000. For more details on this topic, see The Holocaust in Poland. In total, according to USHMM archives, "The Germans established at least 1000 ghettos in German-occupied and annexed Poland and the Soviet Union alone." The list of locations of the Jewish ghettos within the borders of pre-war and post-war Poland is compiled with the understanding that their inhabitants were either of Polish nationality from before the invasion, or had strong historical ties with Poland. Also, not all ghettos are listed here due to their transient nature. Permanent ghettos were created only in settlements with rail connections, because the food aid (paid by the Jews themselves) was completely dependent on the Germans, making even the potato-peels a hot commodity. Throughout 1940 and 1941, most ghettos were sealed off from the outside, walled off or enclosed with barbed wire, and many Jews found leaving them were shot. The Warsaw Ghetto was the largest ghetto in all of Nazi occupied Europe, with over 400,000 Jews crammed into an area of 1.3 square miles (3.4 km2), or 7.2 persons per room. The Łódź Ghetto was the second largest, holding about 160,000 inmates. In documents and signage, the Nazis usually referred to the ghettos they created as Jüdischer Wohnbezirk or Wohngebiet der Juden, meaning "Jewish Quarter". By the end of 1941, most Polish Jews were already ghettoized, even though the Germans knew that the system was unsustainable; most inmates had no chance of earning their own keep, and no savings left to pay the SS for further deliveries. The quagmire was resolved at the Wannsee conference of 20 January 1942 near Berlin, where the "Final Solution" (die Endlösung der Judenfrage) was set in place. The settlements listed in the Polish language, including major cities, had all been renamed after the 1939 joint invasion of Poland by Germany and the Soviet Union. Renaming everything in their own image had been one way in which the invaders sought to redraw Europe's political map. All Polish territories were confiscated as either Nazi zones of occupation (i.e. Bezirk Bialystok, Provinz Ostpreußen, Reichskommissariat Ostland, etc. ), or Soviet brand-new extensions to the two fledging western republics (i.e. West Belarus), soon overrun again in Operation Barbarossa. The Soviet Ukraine and Byelorussia witnessed the genocide of Poles just prior to invasion, resulting in the virtual absence of ethnic Poles in the USSR along the pre-war border with Poland since the Great Terror. Only 38 days after the 1939 Nazi German Invasion of Poland, the first large ghetto of World War II was set up at Piotrków Trybunalski on October 8, 1939. 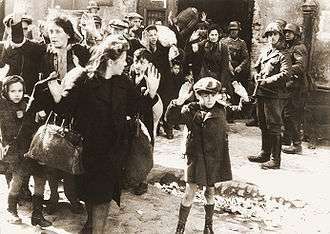 Within months, the most populous Jewish ghettos in World War II included the Łódź Ghetto (set up in April 1940), and the Warsaw Ghetto (October 1940). 3 Będzin Ghetto 7,000–28,000 1940–07 !Jul 1940 1943–08 !Aug 1943 to Auschwitz (7,000). 5 Bodzentyn 700 1940 1942–09 !Sep 1942 to Suchedniów ghetto → Treblinka. 11 Ciechanów 5,000 1940 1942–11 !Nov 1942 to labour camps (1,500), Mława Ghetto → Auschwitz, many killed locally. 43 Mogielnica 1,500 1940 1942–02–28 !28 Feb 1942 to Warsaw Ghetto (all) → Treblinka. Under the codename Operation Barbarossa Germany entered the Soviet occupation zone of Poland on 22 June 1941. 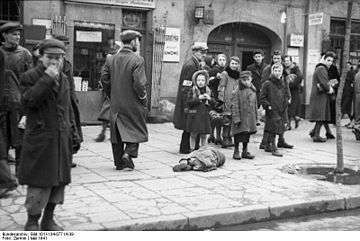 The creation of new Jewish ghettos behind Nazi-Soviet demarcation line and mass executions on-site by mobile killing squads intensified. 108 Ciepielów 600 1941–12 !Dec 1941 1942–10–15/29 !15 / 29 Oct 1942 to Treblinka → Polish rescuers killed locally 6 Dec 1942. 123 Hrubieszów (open type) 6,800–10,000 1941–06/1942–05 !Jun 1941 – May 1942 1943–05/1943–09 !May – Nov 1943 to Sobibor and Budzyn labour camp, many shot locally, 2,000 fled. 129 Jedwabne 100–130 1941–07 !Jul 1941 1941–11 !Nov 1941 to Łomża Ghetto → Treblinka, 340 killed locally. 143 Kraków Ghetto 20,000 (pop. 68,500) 1941–03 !Mar 1941 1943–03 !Mar 1943 to Bełżec extermination camp and Płaszów; 48,000 expelled in 1940. On January 20 at the Wannsee conference near Berlin, Reinhard Heydrich informed senior Nazi officials that "the final solution of the Jewish question" was deportation from the ghettos and subsequent mass extermination of the Jews. Implementation plan developed. Six death factories were built by German firms in occupied Poland within two-to-six months. 261 Łachwa Ghetto 2,350 1942–04–4 !4 Apr 1942 1942–09 !Sep 1942 killed locally, 1,500 in an uprising. 263 Międzyrzec Podlaski Ghetto 20,000 1942–08–28 !28 Aug 1942 1943–07–18 !18 Jul 1943 to Treblinka (17,000), hundreds killed locally. The ghetto inhabitants – most of whom were killed during Operation Reinhard – possessed Polish citizenship before the Nazi–Soviet invasion of Poland, which in turn enabled over 150,000 Holocaust survivors registered at CKŻP to take advantage of the later repatriation agreements between the governments of Poland and the Soviet Union, and legally emigrate to the West to help form the nascent State of Israel. Poland was the only Eastern Bloc country to allow free Jewish aliyah without visas or exit permits upon the conclusion of World War II. By contrast, Stalin forcibly brought Soviet Jews back to USSR along with all Soviet citizens, as agreed to in the Yalta Conference. ↑ Yitzhak Arad, Belzec, Sobibor, Treblinka. Indiana University Press, Bloomington and Indianapolis, 1987. 1 2 3 4 5 6 7 The statistical data compiled on the basis of "Glossary of 2,077 Jewish towns in Poland" by Virtual Shtetl Museum of the History of the Polish Jews (English), as well as "Getta Żydowskie," by Gedeon, Archived November 22, 2012, at the Wayback Machine. (Polish) and "Ghetto List" by Michael Peters at ARC 2005 (English). Some figures might require further confirmation due to their comparative range. 1 2 Michael Berenbaum, The World Must Know, United States Holocaust Memorial Museum, 2006, p. 114. ↑ Wojciech Roszkowski, Historia Polski 1914–1997, Warsaw 1998. PDF file, 46,0 MB (available with purchase). Chomikuj.pl, 2013. 1 2 Dwork, Deborah and Robert Jan Van Pelt,The Construction of Crematoria at Auschwitz, W.W. Norton & Co., 1996. ↑ Cecil Adams, "Did Krups, Braun, and Mercedes-Benz make Nazi concentration camp ovens?" ↑ Jewish Virtual Library, Łódź. Overview of the Litzmannstadt Ghetto's history. Accessed June 27, 2011. ↑ Kraków Ghetto including photographs, at www.krakow-poland.com. ↑ "Schindler's Krakow," with modern-day photographs of the WWII relics. Internet Archive, saved from Silentwall.com (discontinued). ↑ Types of Ghettos. United States Holocaust Memorial Museum, Washington, D.C.
1 2 Peter Vogelsang & Brian B. M. Larsen, "The Ghettos of Poland." The Danish Center for Holocaust and Genocide Studies. 2002. ↑ "A letter from Timothy Snyder of Bloodlands: Two genocidaires, taking turns in Poland". The Book Haven. Stanford University. December 15, 2010. Retrieved April 25, 2011. ↑ Tomasz Sommer (2010). "Execute the Poles: The Genocide of Poles in the Soviet Union, 1937-1938. Documents from Headquarters". Warsaw: 3S Media. p. 277. ISBN 83-7673-020-7. Retrieved April 25, 2011. ↑ Location names in other languages are available through the active links. 1 2 Yad Vashem. "Piotrkow Trybunalski" (PDF). Shoah Resource Center. The Holocaust Martyrs' and Heroes' Remembrance Authority. ↑ Maciej i Ewa Szaniawscy, "Zagłada Żydów w Będzinie w świetle relacji" (Extermination of Jews in the light of testimony). (Polish) According to 1946 research by Wojewódzka Żydowska Komisja Historyczna in Katowice, wrote Maciej i Ewa Szaniawscy, there were around 30,000 Jews in Będzin following the invasion, including those who came in from neighbouring settlements. Between October 1940 and May 1942, the first 4,000 Jews were deported. In May 1942 additional 2,000 and in August, 5,000 more. Deportations between August 1942 and mid June 1943 amounted to additional 5,000. On 22 June 1943 the next transport of 5,000 Jews departed to Auschwitz, and finally, between 1–3 August 1943, the remaining 8,000 were sent away. The dispersed Jews who stayed, amounting to 1,000 persons, were deported between early October 1943 and July 1944. 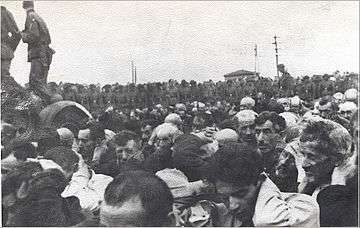 In total, about 28,000 Jews are believed to have been deported from the Będzin Ghetto. This information however, is not confirmed by the two main sources of the remaining data nor the Jewish Historical Institute, listing only 7,000 victims. ↑ Będzin in the Jewish Historical Institute community database. Archived February 16, 2012, at the Wayback Machine. Warsaw. ↑ Iwona Pogorzelska, Bodzentyn od 1869 roku do niepodległości. Polska.pl. Accessed June 16, 2011. 1 2 Martyna Sypniewska. "Historia Żydów w Ciechanowie" [History of the Jews in Ciechanów]. Jewish Historical Institute (ŻIH), Dział Dokumentacji Zabytków; J. Szczepański, D. Piotrowicz (in Polish). Virtual Shtetl (Wirtualny Sztetl). Czerwony Bór massacres. ↑ Patrycja Bukalska (20 January 2010). "Róża Robota postanowiła walczyć do końca" [Róża Robota chose to fight till the end]. Pamięć Auschwitz (4/2010). Tygodnik Powszechny. ↑ "Cmentarz żydowski w Mogielnicy (Jewish cemetery in Mogielnica)," at Kirkuty.xip.pl. 1 2 Piotrków Trybunalski – Getto w Piotrkowie Trybunalskim. Virtual Shtetl. Museum of the History of the Polish Jews. Accessed July 1, 2011. ↑ Angelika Lasiewicz-Sych, "Traces of the past", Kultura Współczesna nr 4 (38), 2003. 1 2 3 4 5 6 Holocaust: "The Jews in the County of Cracau (sic)." The JewishGen ShtetLinks. Accessed June 28, 2011. ↑ "Brześć – History". Virtual Shtetl, Museum of the History of Polish Jews. p. 12. Retrieved July 15, 2011. 1 2 Yitzhak Arad, Belzec, Sobibor, Treblinka: The Operation Reinhard Death Camps. Indiana University Press. "Appendix A." Page 395. ↑ "Życie za Życie" (Righteous of Ciepielów who paid the ultimate price)." Urząd Gminy w Ciepielowie. (Polish). Accessed July 6, 2011. ↑ "Ćmielów – Historia," Muzeum Historii Żydów Polskich Wirtualny Sztetl (Museum of the History of the Polish Jews). Accessed July 6, 2011. ↑ Geoffrey P. Megargee; Christopher Browning; Martin Dean (2012). "Gniewoszów". The United States Holocaust Memorial Museum Encyclopedia. Indiana University Press. pp. 224–225. ISBN 0-253-35599-0. Retrieved April 9, 2012. 1 2 The Hrubieszow Genealogy Group. ShtetLinks Project. Accessed June 30, 2011. ↑ "Getto w Iwacewiczach". Virtual Shtetl. Museum of the History of Polish Jews. Retrieved April 11, 2012. ↑ "Archived copy". Archived from the original on February 12, 2012. Retrieved May 20, 2015. CS1 maint: Unfit url (link). Pamięć Miejsca. Retrieved April 12, 2012. ↑ "Izbica. History". Virtual Shtetl. Museum of the History of Polish Jews. pp. 3 of 6. Retrieved April 12, 2012. ↑ Kraków – History. Page 3. Virtual Shtetl, Museum of the History of Polish Jews. Accessed July 12, 2011. ↑ Niemiecki obóz tranzytowy Kiełbasin w Grodnie (wul. Sołamawaj) (Kiełbasin transit camp), Virtual Shtetl, POLIN Muzeum Historii Żydów Polskich 2015. Accessed November 15, 2015. 1 2 Jack Kugelmass, Jonathan Boyarin, Zachary M. Baker, From a ruined garden: the memorial books of Polish Jewry, United States Holocaust Memorial Museum. Accessed June 27, 2011. ↑ Jack Fischel, The Holocaust, Greenwood Publishing Group, 1998, pg. 58; in Google Books. 1 2 3 "Treblinka Death Camp Day-by-Day," Archived May 22, 2013, at the Wayback Machine. at Holocaust Education & Archive Research Team (www.HolocaustResearchProject.org). Accessed June 30, 2011. ↑ YIVO Encyclopedia of Jews in Eastern Europe, Lutsk. "Following the Soviet liberation of Łuck in February 1944, only about 150 Jews returned. By 1959, just 600 Jews were living in Lutsk. The fortified synagogue was turned into a movie theater and later into a sports hall. A residential area was constructed on the site of the Rabbinite and Karaite cemeteries." ↑ "Osiek. History of Jewish community". Virtual Shtetl. Museum of the History of Polish Jews. Retrieved April 8, 2012. ↑ Paul, Mark (September 2015). "Patterns of Cooperation, Collaboration and Betrayal: Jews, Germans and Poles in Occupied Poland during World War II" (PDF). Glaukopis. Foreign language studies. 159/344 in PDF. Retrieved 25 February 2016. ↑ Geoffrey P. Megargee; Christopher Browning; Martin Dean. "Pionki by Jolanta Kraemer". The United States Holocaust Memorial Museum Encyclopedia. Indiana University Press. pp. 278–279. ISBN 0-253-35599-0. Retrieved April 10, 2012. ↑ Piotr Berghof, "Radoszyce, wspomnienie o żydowskich mieszkańcach miasteczka." (Polish). Accessed June 27, 2011. ↑ Słonim – History. Jewish community. Virtual Shtetl. Museum of the History of Polish Jews. (Polish) Accessed July 7, 2011. The prewar Polish city of Słonim was overrun by the Red Army in September 1939 and confiscated as part of Western Belarus. The influx of refugees from Nazi-occupied Poland increased its Jewish population to 27,000. Over 1,000 were deported to Siberia by the NKVD. Following German invasion of USSR, the ghetto was set up in August 1941, but mass executions began already on 17 July (1,200 men shot just outside the city). A second shooting action took place on 14 November 1941 with 9,000 killed. The ghetto was burned to the ground with all its inhabitants between 29 June and 15 July 1942 following a revolt. Only about 500 managed to escape. 1 2 Shmuel Spector; Geoffrey Wigoder (2001). The Encyclopedia of Jewish Life Before and During the Holocaust. NYU Press. p. 1255. ISBN 0-8147-9356-8. Retrieved June 29, 2011. ↑ "Tarnobrzeg. Warto zobaczyć" (Tarnobrzeg worth seeing), Wydawnictwo Bezdroża. Accessed June 27, 2011. ↑ Wadowice – Historia. Wirtualny Sztetl. (Polish). Accessed June 27, 2011. ↑ "Chronology of Vilna Ghetto," at Vilnaghetto.com without additional confirmation of quantitative data. Accessed June 24, 2011. ↑ "The Deportation of the Zabludow Jews to Treblinka Death Camp." 2003 Tilford Bartman, Jerusalem, Israel. ↑ Geoffrey P. Megargee; Christopher Browning; Martin Dean. "Radom Region by Jolanta Kraemer". The United States Holocaust Memorial Museum Encyclopedia. Indiana University Press. pp. 355–356. ISBN 0-253-35599-0. Retrieved April 9, 2012. ↑ "The History of Miedzyrzec Podlaski." Association of Immigrants of Mezritch Depodalsia Area in Israel. Accessed July 5, 2011. ↑ "Mezritch (Międzyrzec) Podlaski in the Jewish sources." Association of Immigrants of Mezritch Depodalsia. Accessed June 16, 2011. ↑ Przysucha, województwo Mazowieckie, Polska. Haapalah Index and Source Database. Accessed July 5, 2011. ↑ Przysucha – History. Virtual Shtetl. Museum of the History of Polish Jews. Accessed July 5, 2011. ↑ Gmina Sucha Beskidzka, powiat suski. Targeo. (Polish). Accessed June 27, 2011. ↑ Stefan Krakowski, Tomaszow Mazowiecki, Jewish Virtual Library. Accessed June 24, 2001. ↑ Philipp Ther; Ana Siljak (2001). Redrawing nations: ethnic cleansing in East-Central Europe, 1944-1948. Rowman & Littlefield. p. 138. ISBN 0-7425-1094-8. Retrieved May 11, 2011. ↑ Arieh J. Kochavi, Post-Holocaust politics: Britain, the United States & Jewish refugees, 1945-1948. Page 15. The University of North Carolina Press. ISBN 0-8078-2620-0 Accessed June 20, 2011.